The Korkers Polar Vortex 600 snow boots are super warm, waterproof and easy to slip on and off — plus they boast an interchangeable sole system. For a company that made its name producing some of the best wading boots for fishing, Korkers is making some great winter and work boots, too. 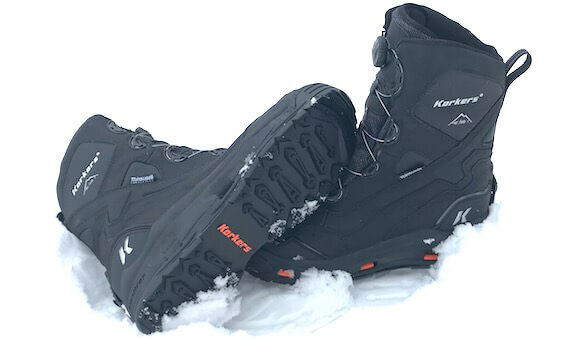 So how did the Korkers Polar Vortex 600 boots get on our radar? When I was reaching out to Korkers about their WRAPTR wading boot (WRAPTR review here) the PR pros at Korkers smartly asked if I had any experience with Korkers winter boots — I had not. To remedy that situation, a few days later Korkers sent along a review unit of its Korkers Polar Vortex 600 boots. The Korkers Polar Vortex 600 winter boots come with an interchangeable sole system. Out of the box, the Korkers Polar Vortex 600 boots look pretty straightforward: Excellent stitching and fit and finish. Sort of technically handsome, actually. Instead of standard laces, the Polar Vortex 600 boots use a BOA M2 lacing system. BOA laces have their fans, but I generally prefer to kick it old-school with standard laces. That said, the BOA lacing system quickly won me over: It’s just easier and faster to get in and out of the Polar Vortex boots than most other winter snow boots I’ve used, especially when your fingers are cold. I’ll probably never convert to BOA for true hiking or hunting boots, but for snow boats? I’m in. Moving on, what matters most? The warmth. The Korkers Polar Vortex 600 boots use 600g of 3M Thinsulate insulation. So are the Polar Vortex 600 boots warm? They’re very warm. I was surprised. When I first tried them out, it was in single digits outside and I only needed the boots for about 15 minutes. They had been sitting in the garage and were already pretty cold. I was wearing a thin pair of cotton socks. I slipped my feet into the cold boots and wondered if they’d ever get warm. In fact, I made a note to myself to disregard this first test because it’s very hard to start with a cold boot with poor insulating socks and end up with a warm foot any time soon. At least with me, that’s the case. But this time, boom, within a few minutes my feet were toasty warm. I was surprised. Backstrap of the sole system. The BOA lacing system works well. The stitching is high-quality, double-stitched for durability. The Korkers OmniTrax 3.0 Interchangeable Soles. When I took them off, I pulled out the insole, and what did I find? A thick and cushiony insole. No doubt this great insole helps with insulation. I later wore these boots fishing with a proper pair of wool socks, and while the temperature ranged from 21-38 Fahrenheit, my feet stayed plenty warm even when I barely moved from one spot for two hours. I also wore them shoveling the driveway, sledding in single-digit weather and to the ski hill, among various other shorter jaunts. In every situation, the boots were easy to get on, were warm and they fit great. Better yet, they were reasonably supportive yet limber and stable enough to enjoy using over uneven ground. The Korkers claim to fame is the company’s OmniTrax Interchangeable Sole system. 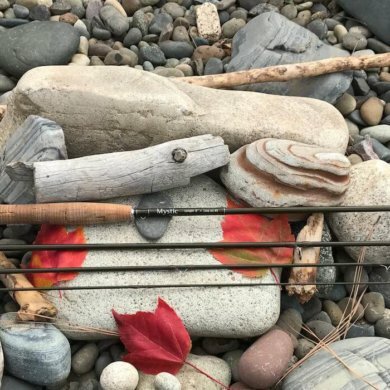 For wading boots for fishing, these soles let anglers use felt soles for wading on slick wet rocks or change their soles to rubber for better on-the-ground traction. This changeable sole system also found fans with anglers who needed to meet some fishing regulations that banned the use of felt soles in some states. On the Korkers winter boots, you get a rubber sole and you also get a sole that’s studded with carbide spikes for extreme traction on icy surfaces. Most people are going to use the plain rubber soles, but it’s nice to have the studded option to keep in the truck for true icy emergencies or ice fishing on slick ice. So how does the interchangeable sole system work? Surprisingly well. The rear of the sole has a tough flat rubber band of sorts that connects to a solid, integrated post in the heel of the boot. Pull that off and you can work the sole out of the grooves that align and hold it in place. This system is surprisingly stable. I don’t know how great the 1.0 versions were, but the 3.0 version of this system in the Polar Vortex 600 is impressive. If you cover a lot of ground in your winter boots and wear out a rubber sole, you can easily replace your old soles with new soles for around $30. That’s cool. 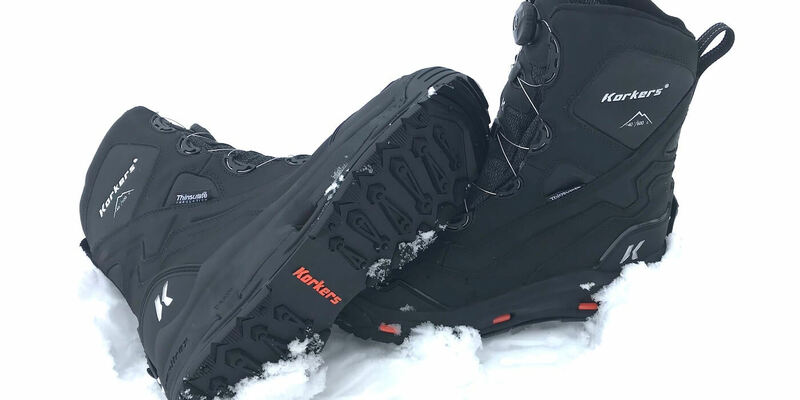 In our initial first look, the Korkers Polar Vortex 600 Boots are fantastic winter boots. The sizing is spot-on, and they compete well against some of the major winter boot brands in comfort, stability and warmth. Based on Korkers’ solid history with wading boots, we expect they’ll hold up over time, too. Highly recommended.